Sientra 107 breast implants for breast augmentation and breast lift surgery are now available. Sientra® 107 breast implants are round breast implants that are filled with their proprietary HSC+ gel. HSC (high strength cohesive) gels are the most cohesive (sticky) gels on the market today. The cohesiveness helps the breast implants to retain their shape. The retention of the shape helps to increase fullness at the upper pole and reduce wrinkling of the breast implants. The HSC+ gels are also soft so they retain the naturalness of the silicone gel for breast surgery. There is a difference in the silicone gel between the Sientra® HSC and Sientra® HSC+ breast implants and I will discuss this in another blog soon. The HSC+ gels were first introduced in shaped silicone breast implants but now they are available in the smooth round form. Sientra® 106 silicone gel breast implants are filled with HSC gel. The Sientra 107 breast implants (HSC+) will provide more upper pole fullness and less wrinkling without an increase in firmness. The next series of photo will compare the Sientra® 107 HSC+ silicone gel breast implant with similar sized Mentor MemoryGel® Silicone gel breast implants. 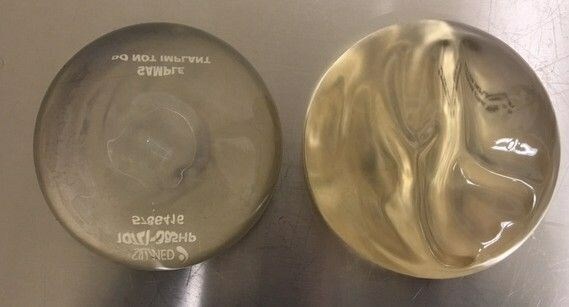 The Sientra® 107 breast implant is on the left and the Mentor breast implant is on the right. Sientra 107 HSC+ Breast Augmentation Case 2: 440cc Sientra 107 breast implants. 440cc Sientra 107 breast implants. I have found the Sientra® 107 silicone gel breast implants along with the Natrelle Inspira® silicone gel breast implants to be a great addition for breast augmentation and breast lift surgery in my practice. Both implants are better at reducing wrinkling of the breast implants and will give you more fullness in the upper part of your breasts.